While I wasn’t overly enamoured with the SNES Mini when it launched last year, the device did have Final Fantasy VI on it (or Final Fantasy III, as it was originally known in the west), and that is inarguably one of the best Final Fantasy games – and indeed, one of the better JRPGs – ever made. In between everything else I’ve been doing, I used the SNES Mini as an excuse to replay the classic, and having now finished it for the sixth or seventh time (I have lost count over the years), I decided it was time to actually write something about it. 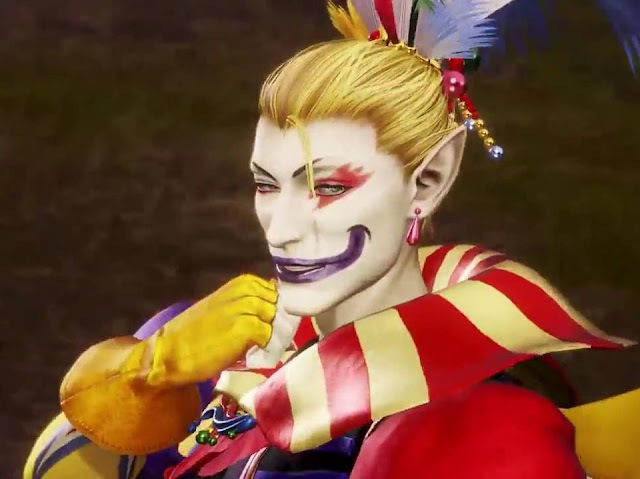 Specifically, I want to write about Kefka, because Kefka is the most memorable character from that particular game. He’s one of the most memorable villains in JRPG history, and that’s because he’s a surprisingly complex character, and one that’s well worth musing over to this day. 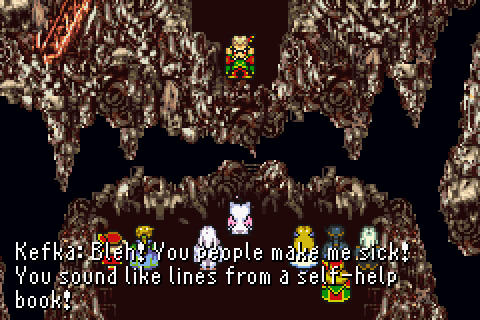 But here’s the thing; Kefka is certainly psychopathic. He’s certainly a villain as far as the heroes are concerned. But he’s not “insane.” Not in the sense that people generally attribute that word. People generally associate “insanity” with a lack of rational thought or reason, but Kefka’s the precise opposite of that. He operates off a completely different moral core, but he’s incredibly rational. And that’s what makes him so fascinating. The philosopher, Michel Foucault, never played Final Fantasy VI, but a lot of his writings hold great relevance to the character of Kefka. One of Foucault’s principle areas of study was the history of insanity, and one of his core theories was that society always needs an “other”; a group of people that share attributes that the rest of society can push out as “diseased”, separate from “decent” society, be feared, and point to as an example of wrongness. “Once leprosy had gone, and the figure of the leper was no more than a distant memory, these structures still remained. The game of exclusion would be played again, often in these same places, in an oddly similar fashion two or three centuries later. The role of the leper was to be played by the poor and by the vagrant, by prisoners and by the 'alienated', and the sort of salvation at stake for both parties in this game of exclusion is the matter of this study." What is of critical interest to Foucault is the evolving definition of “madness” or “insanity” as it replaced leprosy as the “other.” Prior to this, madness was seen as a form of wisdom, and the “insane” would provide insights that “normal” people could not. Later, however, it became the pejorative that has persisted to this day, and the “insane” were typically isolated, if not locked up. Then, in trying to derive meaning from this, Kefka comes to the belief that the real meaning of existence is in non-existence. “I will destroy everything... I will create a monument to non-existence!” he proclaims. None of this is really the indication of someone who is “insane,” in the way that we use the word in a modern context to imply irrationality and impulsiveness. Kefka's logic is not a logic that many would agree with, but in the spirit of philosophical debate, it’s both rational and considered. Kefka’s “insanity,” is as per Foucault, is not so much insanity at all, but rather it's because we “other” him as being too foreign and alien to our own expectations of acceptable behaviour and thought to tolerate. Niccolò Machiavelli is a very misunderstood political philosopher. Too often people read his defining work, The Prince (or, more likely, select quotes from it), and assume that he advocates for political leaders to be complete tyrants. With lines like “people should either be caressed or crushed. If you do them minor damage they will get their revenge; but if you cripple them there is nothing they can do. If you need to injure someone, do it in such a way that you do not have to fear their vengeance,” it’s hard to deny there is credibility in that assessment. At the same time, the time in which Machiavelli wrote The Prince, there was political unrest throughout Europe. Weak leaders fought wars with the Catholic church, city states were constantly attacking one another, and mercenaries were in great demand by all, but would change sides at the drop of a hat. That political unrest itself created by weak leadership is a kind of abstract tyranny that doesn’t make citizen’s lives any happier or healthier. Machiavelli’s The Prince can therefore also be read as a work of unyielding realism; a political leader does need to consolidate his or her power base in order to do right for his or her people, and will need to make difficult decisions in which they will need to hold morality as a secondary consideration. As fine as lofty thought bubbles around morality are, ultimately, a community is better served by a stable political environment. I should say that I don’t really have a view on Machiavelli either way, since Machiavellian politics has been used for both real evil in the modern world, while there are other situations where strong leadership and stability is desperately needed, and a Machiavellian approach would seem to be the only way to deliver that. I’m not here to judge the morality of Machiavellian politics itself, but rather highlight that, as with most things in philosophy, there are arguments and counter arguments, and this applies to Kefka himself. Earlier I discussed Kefka’s mental state divorced from concepts of morality. Now let’s put the discussion of morality back in. Machiavelli would have argued that a lot of what Kefka did in Final Fantasy VI was justified. If not outright moral. 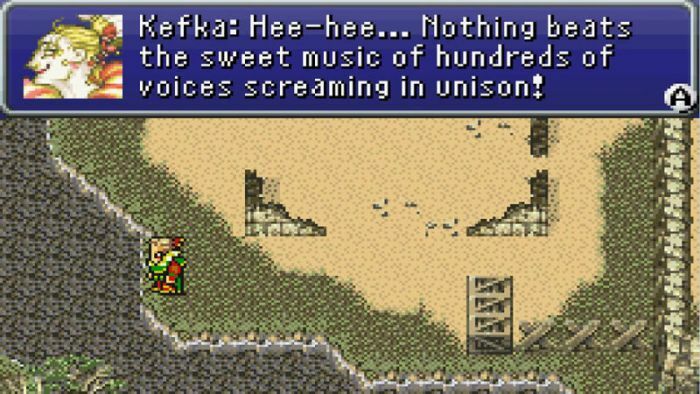 You could argue that his juvenile sense of humour about his actions don’t exactly help his cause, but Kefka is a remarkably effective tyrant (at least, until he becomes a God and decides that existence is pointless). Let’s take the most horrific thing that Kefka does; poisoning the water of an entire city. It results in untold deaths, and most of them innocent. But at the same time, the city was at war with Kefka’s people, and as a political leader, Kefka’s responsibility was not to his opponents. His job was to preserve the lives of his own people and army, and without a doubt, his solution would have saved the lives of many of his people, who would have otherwise perished in an attack on the castle. There are parallels in the real world. Situations that many people have indeed argued are quite justified. America dropped nuclear bombs on civilian targets in Japan in World War 2 in a bid to hasten Japan’s surrender, and save the death toll of a ground campaign onto Japanese soil. How is this different to poisoning a river to hasten a conquest? The answer is that it's not. It's the same thought process, the same result, and it was every bit as effective. Then there’s the morality of Kefka’s divine nihilism. 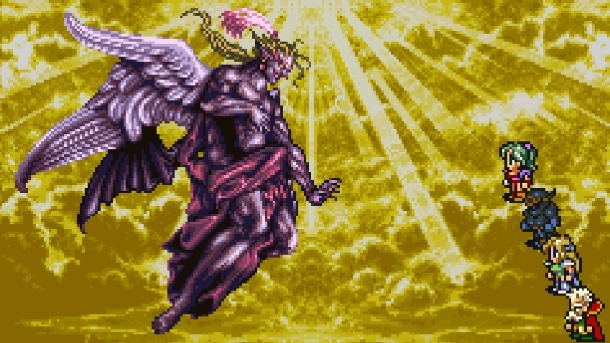 At the point of achieving Godhood, Kefka decides that existence is pointless, and non-existence is the superior state. Again, the idea that Kefka would want to destroy everyone and everything is something that would strike us all as fundamentally immoral on the surface, and we’re certainly meant to see Kefka as the villain that needs to be stopped. He is, after all, an existential threat to the self interest of the player’s heroes, even considering nothing else, and there’s a fundamental righteousness and moral imperative to preserve one’s life – but the flip side to that coin is that Kefka is indeed a God and the nature of faith is that we’re meant to assume that divine beings are possessed of a wisdom beyond the comprehension of our limited minds. Remember – Kefka isn’t really insane, so perhaps, just perhaps, his infinite wisdom means he's right. That or Square was making a point about religion there, and yet another discussion that the game has constructed around this fascinating character. This discussion is all the more poignant now that games such as Hellblade have appeared, and game developers are starting to challenge the way we, as an artistic industry, often depict and discuss mental health, mental illness, and rationality. Games with a more complex understanding of morality are also starting to question the default response we have when presented with “good guys” and “villains,” and it’s impressive to know that, perhaps inadvertently, Kefka anticipates these discussions by well over a decade. And perhaps his nuance was a happy coincidence, though I like to think the developers at Square at the time knew exactly what they were doing with Kefka, and that’s why he’s turned out to be such an interesting villain. 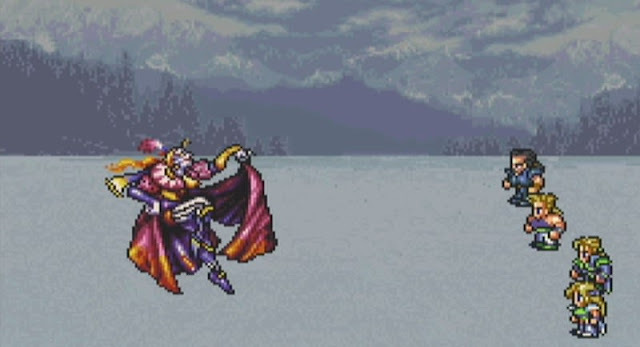 For example, I believe that Ultros, the octopus villain who really does have no purpose in the game beyond being a generic (but amusing) evil, was placed in the game to contrast with Kefka and encourage players to think more deeply on the implications of Kefka as a villain precisely because there's more to him than Ultros. Foucault himself was broadly critical of the “othering” process that he describes with regards to how the “insane” are treated in society, and the maniacal nature of Kefka, which we have all assumed for many years – and Square Enix has itself since encouraged and promoted through his depiction in games such as the Dissidia Final Fantasy series – is one we should reconsider. I don’t believe Kefka is mad, as such. And that makes him all the more interesting villain for it.